Over the past few years, there has been dialogue and debate in the health promotion literature on appropriate approaches to health promotion evaluation (Labonte & Laverack, 2001; Springett, 2001). A basic premise of this book is that evaluation must be sensitive of the principles of health promotion to be able to contribute to the overall objectives of health promotion. 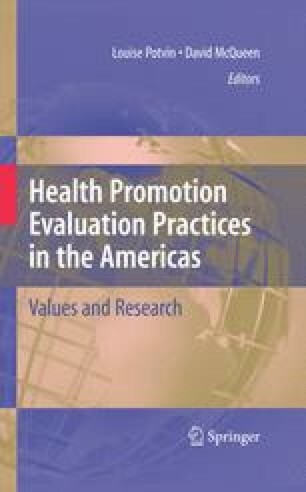 In this chapter, we take up the challenge inherent in this premise and hope to contribute to the dialogue on appropriate approaches to health promotion evaluation. We do this by retrospectively comparing two unique cases in which we experienced challenges in enacting the principles of participation and empowerment in our evaluations. In a cross-case analysis, we identify and elaborate on the themes that emerged in the comparison and draw some conclusions about the application of these principles in evaluating health promotion.